Written by: John Snell and Rob Spring, P.E. Download this white paper to read the entire article. Every year in the United States, faulty electrical/lighting equipment causes more than 45,000 structural fires. On average, these fires kill at least 240 people, injure 1,200, and inflict more than $1 billion in direct property damage. Infrared testing has become the most widely recommended method for detecting these critical electrical faults before they cause catastrophic fires. "Routine infrared inspections of energized electrical systems should be performed annually..."
"Infrared inspections of electrical systems are beneficial to reduce the number of costly and catastrophic equipment failures and unscheduled plant shutdowns." "Infrared inspections have uncovered a multitude of potentially dangerous situations. Proper diagnosis and remedial action of these situations have also helped to prevent numerous major losses." "Infrared detection can be accurate, reliable, and expedient to use in a variety of electrical installations. More important, it can be relatively inexpensive to use considering the savings often realized by preventing equipment damage and business interruptions." "Many organizations are finding it preferable to obtain these surveys from qualified outside contractors. Because of their more extensive experience, their findings and recommendations are likely to be more accurate, practical, and economical than those of a part-time in-house team." Differences in surface temperatures reveal many remarkable qualities about a building. Thermographic technology has vastly improved over recent years, allowing the Infrared Thermal Inspection Specialist the opportunity to lower the costs of their independent visual surveys. In fact thermography has become one of the most cost effective means of identifying and resolving many adverse conditions. Infrared inspections and surveys are increasingly requested for commercial, and industrial applications. These inspections utilize the same technology found in military, aerospace, and medical applications. Infrared thermal inspections have helped commercial investors, net lease occupants, commercial real estate investors, commercial property management firms, residential properties, industrial preventive maintenance, building management firms, maintenance teams, general contractors, renovators, commercial inspectors, real estate specialists, builders, and rennovation specialists. Thermal Infrared Inspections are vitally important to detect otherwise unknown or virtually invisible issues and concerns. At some point in time, building owners will become affected by high energy costs, heavy rains, leaks, and periodic flooding. Infrared Inspection Technology can assist with these environmental and building concerns and greatly reduce damage and repair costs associated with them. Below are a few examples of the amazing insight and view an Infrared Thermal Inspection can provide by a qualified National Association of Commercial Building Inspector! To prepare for an interior thermal scan, the homeowner should take steps to ensure an accurate result. This may include moving furniture away from exterior walls and removing drapes. The most accurate thermographic images usually occur when there is a large temperature difference (at least 18°F) between inside and outside air temperatures. In northern states, thermographic scans are generally done in the winter. In southern states, however, scans are usually conducted during warm weather with the air conditioner on. The NFPA specifically recommends the use of infrared thermography to inspect electrical power distribution equipment at least annually. Gives guidance on examining electrical and mechanical equipment. It recommends that critical equipment should be inspected every six months, or more often as deemed appropriate for safety and productivity. Specifically refers to methods of charting time over condition, setting base line trends so that problems can be rectified before breakdown occurs. Infrared (IR) inspection is a fast and noninvasive means of monitoring and diagnosing the condition of buildings. An IR camera can instantly identify problem areas that can be immediately documented into a thermal inspection report which clients and concerned parties will easily comprehend. IR gives the home inspector a great new tool that helps to elevate him as a professional using state-of-the-art equipment. Thermography enables us to see and measure heat. All materials on earth emit heat energy, in the infrared portion of the spectrum. Unfortunately, the unaided human eye cannot see in the infrared. Infrared images allow the camera user to see temperature anomalies that identify potential problems in buildings and their component electrical, mechanical, plumbing, and waterproofing systems. Today’s lightweight and rugged infrared cameras can not only see in real-time, but can also record infrared images and measure the temperatures of target objects quite accurately. Points of possible concern show up clearly as hot or cold in relation to their surroundings. Recorded thermal information can be easily inserted into reports, and widely distributed, greatly facilitating communications among trades, attorneys, and other professionals and serving as invaluable, rational, evidentiary data in cases involving controversy. Moisture intrusion and potential mold in walls and ceilings. IR thermal imaging is much faster, noninvasive, and provides evidentiary-quality, intuitively understandable data having a much higher degree of accuracy and reliability than other moisture detection technologies used to trace the source and scope of water damage, and thus potential mold in buildings. Once the IR camera identifies areas with thermal differences, a moisture meter can be used to confirm that they represent moisture. Missing or damaged insulation. An IR camera can quickly and non-destructively detect areas of missing, moisture-laden or otherwise damaged insulation in walls, crawlspaces and attics or around doors, windows, electrical outlets and other access plates. All of these problems can increase a building’s energy costs by allowing cold air to enter the building and heated air to escape in the winter, and the reverse in the warmer, summer months. IR can also identify poorly or un-insulated pipes, another source of costly heat loss. Faulty electrical mechanical and HVAC systems and components. Infrared cameras are very effective at detecting overloaded circuits, faulty wiring, and loose electrical connections, which generate heat, and can pose serious fire hazards. IR can detect thin spots in furnace heat exchangers and flues, mechanical problems such as worn, under-lubricated pumps, motors, and bearings in fans, compressors, and furnaces, electrical faults, refrigerant leaks and blockages in HVAC components, another source of costly energy waste. Leaking roofs. Roof leaks can cause costly damage to a building’s contents and discomfort to its inhabitants. An infrared inspection can quickly identify missing or moisture-soaked insulation under a flat roof membrane where the insulation needs replacement, permitting the surgical repair of failed areas rather than the much more costly replacement of the entire roof. Construction defects. The increased use of EIFS (Exterior Insulation and Finish Systems) and stone, stucco, brick veneers and siding as facades on residential as well as commercial buildings invites the possibility of water intrusion if they are not properly installed. IR can detect or verify moisture infiltration in these weatherproofing ‘barrier’ systems, usually the result of insufficient detailing such as inadequate or improperly applied flashing or sealants. In addition, IR can monitor and track moisture migration paths within the wall cavity. Post-fire inspections. After fires, IR can quickly locate remnant hot spots, assuring the fire is completely extinguished and provide invaluable data for insurance companies’ Cause and Origin investigations. The clear IR images of normally invisible diagnostic evidence can assist in the planning and execution of the restoration effort and in the settlement process. Termites. Although considered cold-blooded creatures, termites are hosts to bacteria, which help break down and digest cellulose, the main ingredient of the wood they digest. The digestion process generates heat, and when large numbers of termites in nests congregate, a substantial amount of heat is concentrated in one area. As this heat moves through the walls or floor of a building, an IR camera can detect it on the surface. What is Infrared (IR) Testing? Building Diagnostics and Preventative Maintenance – Commercial and Residential IR testing can be used in a myriad of applications as a form of inspection by evaluating a variety of building components. By conducting a thorough evaluation of these component's temperature signatures during normal operating conditions, one can perform real time or periodic IR inspections to detect thermal differences from the norm in order to avoid costly repairs. This kind of preventative or predictive maintenance is critical to maintaining all types of structures. Roofing - IR testing is used to detect water damage and leaks beneath the surface of the roofing system allowing the opportunity repair the specific section before it continues to spread. Localized spot or partial repair vs. entire roof system tear off and replacement saves our clients tens and hundreds of thousands of dollars per event. This makes any IR testing pay for itself in overall reduced end user costs. Electrical - IR testing may be used as a means to detect potential wiring, circuit overload, or areas of unusually high electrical resistance, allowing electricians to repair or replace the components before failure, eliminating fire potential, costly downtime, or further damage to the electrical systems or downstream appliances. With ever-rising energy costs and ongoing environmental concerns, these days nearly everyone is focused on conserving energy. Heated air escaping during the winter months and cooled air leaking out during the summer months are sure signs utility bills will soar. Finding the source of energy loss--whether it's poor insulation in the walls and ceilings or shoddy construction around the windows and doors--can be a costly, time-consuming and intrusive endeavor. Finding the source of water leaks in roofs can be even tougher. Thanks to the growing practice of infrared camera inspection, however, homeowners now have the ability to track the causes of energy loss without resorting to tearing open walls or pulling up roofing tiles. Infrared imaging is a diagnostic technology allowing users to instantly visualize and measure the thermal energy emitted from an object. Measuring thermal energy helps identify areas where energy is being wasted. Because the human eye cannot detect thermal energy, infrared cameras are typically used to instantly display an area's thermal performance. While traditional cameras detect, record and display visible light, infrared cameras detect and record heat--or more precisely, the difference in temperature between surfaces--and display that information as a visible image. Using an infrared camera is like having thermal vision. Infrared cameras can reveal damaged insulation in ceilings and behind walls, uncover bad wiring and overloaded circuits, and pinpoint the source of roof leaks. They go beyond measuring surface issues, without requiring the demolition of walls or direct inspection of insulation. The benefits to homeowners can be tremendous. If a residence is losing a significant amount of heat during the winter months, an infrared camera can detect whether the insulation in the walls is moisture laden or otherwise damaged. The technology enables home inspectors to do things they were not able to do before without being terribly invasive. Now instead of just suspecting what the problem is, they are in a position to resolve a problem on site. Inspectors use infrared cameras to look for damaged or inferior insulation behind walls, electrical and wiring problems, water leaks in roofs and even termite infestation causing wood damage. Infrared camera inspectors are often contacted by homeowners after they experience a leak in their roof, and repeated visits from roofers fail to fix the problem. By using thermal scans to find the source of a leak, inspectors can save customers several thousand dollars in potential ceiling and structural damage. Beyond finding sources of energy leaks and roofing problems, an infrared camera can be instrumental during the construction phase of a building to obtain documentation of whether contractors are delivering the quality of service expected. Using infrared cameras, inspectors can verify whether the contractors have used insulated piping in a new construction building's walls. They can confirm if the contractor has sealed the windows properly and looked for leaks in roof membranes. Identifying these problems during the construction phase can potentially save home owners considerable time, effort and money. The infrared camera is like a smoking gun. It provides evidence the contractors are building everything as specified and designed. Smoking guns come at a price, however. An infrared camera typically cost as low as $5,000, and high-end models can cost more than $30,000. Camera costs aside, conducting proper thermal audits involves more than learning how to operate the camera. Reading and interpreting a thermal image takes training, much like reading a medical X-ray requires a trained radiologist. Without that training, an individual cannot properly analyze and evaluate an infrared image. The cost of a thermal audit varies, depending on the size of the building and the vendor. Prices generally cover the thermal audit and a detailed report analyzing the results of the thermal images. Inspectors estimate that a thermal inspection can pay for itself in two to five years, depending on the extent of the repairs suggested as a result of the audit. For instance, if an audit indicates a new furnace is needed, the payback in increased energy efficiency could take five years. If only minor ceiling repairs are necessary, the payback could be as short as two years. Savings also come into play because infrared imaging can pinpoint the exact problem, and then a thermal auditor can typically offer an explanation and immediate solutions. Having a variety of general contractors repeatedly come out and offer trial-and-error solutions can be costly and frustrating. The nature of thermography applications is people can actually see what's going on, and inspectors can source the cause and effect of a problem. It gives them a plan of action with their contractors and maintenance people, and it eliminates the guess work. To maximize the benefits from infrared technology, homeowners should have thermal audits done every few years. Regular thermal scans can help catch problems early. An infrared camera resolves issues without a lingering doubt. It solidifies the inspection, whereas without it there still might be some lingering issues. In the long run, more and more homeowners will be taking advantage of this technology. What is Marine Infrared Thermal Scanning? Have you ever had a problem with your vessel while at sea? Do you know the condition of your boat’s electrical and mechanical systems? Does your vessel have any structural defects or damage? An infrared marine inspection can ease your mind and answer these questions for you. Infrared thermography of a vessel can detect serious faults such as damaged fiberglass gel coat, loose electrical connectors, faulty electrical systems, and failing engine components. How does marine infrared thermal scanning work? What do I get? A Thermal Scan can offer you enhanced marine safety and the ability to prevent costly catastrophic offshore failures by detecting developing faults with critical systems. As part of an early detection system, ACE Thermal Imaging performs the scans with pinpoint accuracy and analyzes thermal images to rapidly identify component and system faults that cannot be seen with the naked eye. An inexpensive review using advanced infrared technology can provide a large return for your very expensive investment. The knowledge you will gain from an infrared marine inspection is a view of your vessel as you have probably never experienced. Infrared provides a thermal image of your vessel and allows for a quick and accurate survey of its condition - structurally and mechanically. Infrared technology in marine applications gives you another level of information to assure safety on the water. It allows for efficient predictive maintenance procedures. Be safe. Insure your loved ones and passengers’ safety with an infrared marine inspection. The costs are low and a vessel under 100 feet typically takes a few hours to complete. Larger vessels, marinas and terminal facilities usually require more time for a complete infrared inspection. Your infrared marine survey will include a comprehensive full color report with all necessary recommendations noted. The temperature of -273.16° C, -459.69° F, or 0° K; thought to be the temperature at which molecular motion vanishes and a body would have no heat energy. The maximum deviation in a set of measurements between the temperature indicated by a radiation thermometer and the known temperature of a reference source, including the uncertainty of the reference temperature source. The accuracy can be expressed in a variety of ways including temperature, percentage of temperature reading, or percentage of full scale temperature of an instrument. Derating or decrease in accuracy of an instrument due to changes in its ambient temp from that at which it was calibrated. See also Temperature Coefficient. Range in the ambient temperature over which the instrument is designed to operate. The temperature of the instrument. Can also refer to the temperature that gives rise to the background. See Background Radiation. ASTM E1256 - 88, Standard Test Methods for Radiation Thermometers (Single Waveband Type). A standard by which Raytek products are tested and calibrated for accuracy, repeatability, resolution, target size, response time, warm-up time, and long-term drift. The spectral bands in which the atmosphere least affects the transmission of radiant energy. The spectral bands are 0.4 to 1.8, 2 to 2.5, 3 to 5, and 8 to 14 micrometers. A procedure that is performed to determine and set the parameters affecting an instrument's performance in order to ensure its designed function within prescribed limits. The temperature scale in which the temperature in Celsius (TC) is related to the temperature in Kelvin (TK) by the formula; TC = TK -273.15. The freezing point of water at standard atmospheric pressure is very nearly 0?C, and the corresponding boiling point is very nearly 100?C. Formerly known as centigrade temperature scale. Temperature band (?) about the set point, wherein an alarm output or relay can not change state, thus providing hysteresis. The German standard for many instrumentation products.f?mung. conditioning features (Peak Hold, Valley Hold, Sample Hold, Average, (1-way RS232, etc.) via the external reset input. Temperature measurement scale where, at standard atmospheric pressure, the freezing point of water is 32?F and the vaporization point of water is 212?F. To convert from Celsius, use F = (C x 1.8) + 32. A source of radiant emissions for which the emissivity is less than 1 but constant and, therefore, independent of wavelength. A standard developed by Hewlett-Packard Corporation and adopted by the IEEE for digital interface between programmable instrumentation. It uses a 16-bit bus to interconnect up to 15 instruments. The standard comprises hardware and protocol options. It is also called the Hewlett-Packard Interface Bus (HPIB) or General Purpose Interface Bus (HPIB) or General Purpose Interface Bus (GPIB). The present standard is ANSI/IEEE-4881-1987. A material used to construct photon detectors that are sensitive in the spectral region from 2.0 to 5.5 ?m and used in infrared scanners and imagers. These detectors require cryogenic cooling. (IR) Radiation within the portion of the electromagnetic spectrum which extends from 0.75 to 1000 ?m. The property of a material to resist the flow of electrical current and expressed in Megohms (M?) as the ratio of an applied electrical potential divided by the flow of electrical current resulting therefrom. A technical governing body that sets standards for determining or establishing the accuracy of IR thermometers. A temperature scale that is directly related to the heat energy within a body. Formally, a temperature scale in which the ratio of the temperatures of two reservoirs is equal to the ratio of the amount of heat absorbed from one of them by a heat engine operating in a Carnot Cycle to the amount of heat rejected by engine to the other reservoir. The temperature of the triple point of water (in this scale) is defined as 273.16? K. To convert from Celsius, K=C+273.16. A material used to make photon detectors that are sensitive in the 3 to 5 ?m spectral band. These detectors require thermoelectric cooling and are used in IR thermometers, scanners, and imagers. Describes the size of a load that can be driven by an instrument with a Loop Impedance mA output. For example a 500 ohm maximum loop impedance means that the instrument can supply 10 volts at 20 mA into this load. A ternary alloy material used to build photon detectors that are sensitive in the 3-5?m and 8-14?m regions of the spectrum and require TE cooling in the 3-5 ?m region and cryogenic cooling in the 8-14?m region. The diameter of the smallest object for which an instrument can meet its performance specifications. National Electrical Manufacturer?s Association. Among its activities, sets US standards for housing enclosures, similar to IEC IP. The ratio of the distance to the target divided by the diameter of the circular (or spot) for which the energy received by the thermometer is a specified percent age of the total energy that would be collected by an instrument viewing a calibration source at the same temperature. The distance to the target is generally the focal distance of the instrument. The percentage energy is generally 90?95%. A system that, by comparing a source whose temperature is to be measured to a standardized source of illumination (usually compared to the human eye), determines the temperature of the former source. Thermal detector that has a signal generated by means of the pyroelectric effect wherein changes in temperature of the detector generates an electrical signal. A broad class of temperature measuring devices, originally designed to measure high temperature, but some are now used in any temperature range. Includes radiation pyrometers, thermocouples, resistance pyrometers, and thermistors. A device used to measure the temperature of an object by quantification of the electromagnetic radiation emitted therefrom. Also, a radiometer calibrated to indicate a blackbody?s temperature. The absolute temperature scale related to Fahrenheit in the equivalent manner Kelvin is to Celsius. R = 1.8 x K, or also R = F + 459.67. Refers to the thermocouple junction that must be known in order to infer the temperature of the other or thermocouple measurement junction. The dimensionless ratio of the actual vapor pressure of the air to the saturation vapor pressure (abbreviated RH). Percent relative humidity is expressed as the product of RH and 100. For example an RH of 0.30 is a percent relative humidity of 30%. The time for an instrument?s output to change to 95% of its final value when subjected to an instantaneous change in target temperature corresponding to the maximum temperature the instrument can measure (per ASTM E 1256). The average time required for software computation within the processor is also included in this specification for Raytek products. A recommended standard developed by EIA that defines a balanced interface and is an expansion of RS-423 that increases the data rate to 10 Mbps. A recommended standard developed by EIA that defines an unbalanced interface and is an expansion of RS-232 and provides improvements included increased connecting cable lengths, increased data rates, and use of multiple receivers on line. A recommended standard developed by EIA that is an improvement over RS-422 in that it allows an increase in the number of receivers and transmitters permitted on the line. An optical or infrared element used to spectrally limit the transmission of radiant energy reaching an instrument?s detector. The diameter of the area on the target where the temperature determination is made. The spot is defined by the circular aperture at the target which allows typically 90% of the IR energy from the target to be collected by the instrument. See also Size-of-Source Effect. A saturation effect whereby the signal from an instrument endures beyond the response time after the target has been removed from the field of view. Can be caused by exposing the sensor to a target of high temperature for an extended period. The effect is expressed as the increase in response time required for the sensor to return to within 5% of the correct reading. A property of an object which determines the direction of heat flow when the object is placed in thermal contact with another object (i.e., heat flows from a region of higher temperature to one of lower temperature). The change in accuracy of an instrument with changes in ambient temperature from that at which the instrument was calibrated. Usually expressed as the percent change in accuracy (or additional error in degrees) per change in ambient temperature. For a rapid change in ambient conditions, refer to Thermal Shock. An error due to a rapid change in the ambient temperature of an instrument. Expressed as a maximum error and the time required for performance to return to prescribed specifications. Cooling based on the Peltier effect. An electrical current is sent through two junctions of two dissimilar metals. One junction will grow hot while the other will grow cold. Heat from the hot junction is dissipated to the environment, and the cold from the other junction is used to cool. A number of similar thermocouples connected in series, arranged so that alternate junctions are at the reference temperature and at the measured temperature, to increase the output for a given temperature difference between reference and measuring junctions. The time it takes for a sensing element to respond to 63.2% of a step change at the target. The condition of temperature and pressure under which the gaseous, liquid, and solid phases of a substance can exist in equilibrium. For water at atmospheric pressure, this is typically referred to as its freezing point. A test where oscillatory or repetitive motion is induced in an object (as per MIL-STD-810 or IEC 68-2-6), which is specified as an acceleration in g?s and power spectral density (PSD), after which the unit is tested for proper operation. Five days ago, I got audited. A man arrived on my doorstep, notebook in hand, and for three hours inspected every room of my house. He asked about my electric bills and scrutinized my home office. But it wasn't tax-filing flaws he sought -- it was fissures in my insulation, doors and window frames. My visitor was a professional energy auditor. His mission: to find my home's inefficiencies and lower my heating and electric bills. 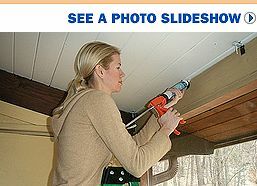 Latex caulk is cheap and goes on quick to plug small openings where the ceiling, window frames and baseboards meet walls. While energy audits have been conducted for decades, often through utilities, many were free, eyeball-only inspections that noted basic woes (the need for more attic insulation) but didn't go much further. In today's world of costly heating and cooling bills, along with carbon-footprint consciousness, there is a fast-growing industry of analysts wielding high-tech tools such as infrared cameras. They produce comprehensive reports on a home's energy efficiency, along with suggested fixes and contractors. Unfortunately, that information doesn't come cheaply -- typically, $300 to $700, though aid often is available for low-income homeowners and some utilities provide audits free. Plus, almost anyone can call himself an "energy auditor," making it tough to know who is legit. Some suggest products and services to fix energy flaws -- but don't always disclose that they have ties to the products' makers or sellers. That has sparked a push by two nonprofit groups to develop a single certification standard, to be announced this year, defining what these intensive audits should include as well as training and ethics criteria for the auditors. "That's the challenge we are facing," says Claudia Brovic, a director with the Residential Energy Services Network (Resnet), one of the two nonprofits. Her group, along with the Building Performance Institute, help certify companies and individuals who offer energy audits, working closely with the Environmental Protection Agency and U.S. Department of Energy. "People need to know what they are getting." 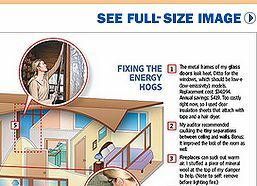 Take a room-by-room look at how Ms. Bounds fixed the energy hogs in her home. 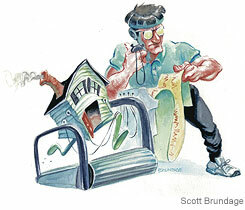 Interest in home audits is rising in tandem with energy prices. Traffic has climbed 53% in the last year on the Energy Department's audit-information Web page, which gives links to reputable auditors. Resnet now has 3,000 certified raters, and Ms. Brovick says interest is "growing fast." One utility, Connecticut Light & Power Co., says that some 4,400 customers received audits last year, double the number in 2006. And many states and utilities make available financial incentives for energy upgrades. For instance, under the PA Home Energy project launched in August, residents of western and central Pennsylvania can get $200 to $1,000 for improvements that lower energy bills. Auditing could become a year-round gig thanks to a movement to mandate audits during home sales. Last week, the Massachusetts Senate passed what could become the first state requirement that home sellers provide prospective buyers with an audit scoring the home's efficiency; several other states are mulling similar moves. Realtor groups oppose the plans, saying they will slow home sales in a weak market. "There's a lot of momentum to have some type of rating done at the time of sale, and it's a very touchy issue," says David Lee of the Energy Star program, an initiative between the EPA and Energy Department. For now, most consumers simply want to know whether it is worthwhile hiring an auditor. While you can find some of the most obvious air leaks yourself, the more advanced exams look at everything from appliance efficiency to potential health hazards like carbon monoxide. They also compute annual savings from suggested fixes. The energystar.gov site estimates that sealing air leaks and adding insulation, for instance, can reduce energy costs 10%. For my part, I vaguely knew where problems lie in my 30-year-old, two-story house in rural New York: in a breezy entranceway and a long swath of glass doors. My annual cost of heating and electricity had leapt nearly $900 last year to about $3,500. But I wasn't sure of the cause or proper remedy. So I called in the pros. My auditor, Chris Puleo, works for BPI-accredited Green Star Insulation in Danbury, Conn. Green Star sells cellulose insulation, which Mr. Puleo discloses on his business card. He calculated my home's interior volume in cubic feet, wrote down model numbers of my appliances and examined my heating system -- an oil boiler that pumps hot water through pipes along the floor. The good news: Since I don't have an attic, recessed ceiling lights or an unfinished basement, and I don't have forced-air heat, which requires ducts, I lack several of the typically leakiest items. But my boiler is old, my industrial freezer guzzles kilowatts and costs about $200 a year to run (a surprise to me), and the hand-me-down washer/dryer set from my parents is horribly inefficient. Afterward, Mr. Puleo attached a fan contraption called a blower door to my front entrance; that pulled air out of the house, letting the higher outside air pressure flow through cracks. He marched around the interior with a smoke stick, which created white smoke that flickered around offending electrical outlets and windowsills. "This is mostly smoke and mirrors," he conceded. "I can walk in here and tell you most of what needs fixing, but it makes a good show for consumers." But the real "aha" came when Mr. Puleo's boss, Joe Novella, arrived with an infrared camera that produced thermographic images of warm and cold areas; it's a tool Energy Star recommends along with the blower door. Dark spots indicated where cold was creeping in: It turns out the metal frames of my sliding glass doors are terrible insulators -- a culprit I'd never considered. Both men had flagged this earlier, but seeing it in Technicolor drove the point home. That night, Mr. Puleo emailed me a 27-page report recommending fixes, many of them costly -- replacing the boiler, buying new appliances and doors. All told, the upgrades totaled a whopping $45,289, which the report cheerfully noted would result in an annual greenhouse-gas reduction equivalent to not driving a car for 11.1 months. Still, he pointed out cheaper ideas, like wedging a bat of mineral wool against my fireplace damper to quell drafts. And he gave me a short list of priority upgrades totaling $2,647 that would yield an estimated $578 in annual savings, such as sealing air leaks, tuning up my furnace, installing a programmable thermostat and replacing my clothes washer. The audit itself cost $299. I'm glad for the new info about my house, and I'm already doing some of the simple solutions myself. Meantime, I'm hoping this is the only audit I will face this year. Level I certification is the first of three levels of IR certification. Level I IR thermographers are typically newer to IR thermographic diagnostics. This does not imply that they are entry-level inspectors or condition monitoring technicians, indeed many Level I professionals have years of experience in construction technology, building practices, and overseeing or maintaining complex systems. Level I thermographers generally follow a written test procedure to evaluate specific types of equipment in their facility. They can operate their infrared cameras and software and identify and measure thermal anomalies based on thermal patterns, comparisons with similar equipment, and their own experience. I strongly encourage you to accompany me so that you may ask questions and gain a better understanding of the systems. If you have any questions, or are interested in any other services, please contact me so we may discuss your specific needs.